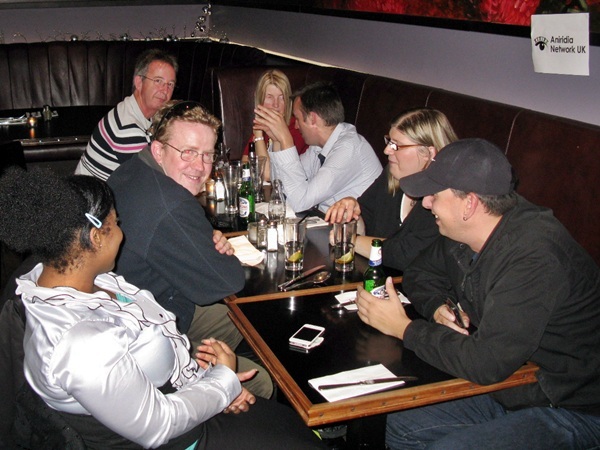 The next aniridia meet-up will be a social evening on Wednesday 7 November 2012 in London. It’s the same date and area as Sight Village London. Like last time it’s going to be a “really interesting night”. Everyone affected by aniridia, including relatives is invited to join us to find out more about each other and discuss aniridia related topics. James and Heather, two adults with aniridia and volunteers for Aniridia Network UK will be your hosts. We know many who couldn’t come last time so hope this time there will be even more people and better still. Once again it’s fringe event of the Sight Village exhibition running nearby on 6 and 7 November. Sight Village is an excellent event about technology, equipment, and support for people who are blind or partially sighted. If you are going on the 7th and would like to meet someone there who is also affected by aniridia, tell us and we’ll try to put you in touch with other visitors. We are currently picking a venue for this meet-up but expect it to be a bar which we will ensure it is as accessible as possible. It will start around 6pm and be close to both the exhibition and High Street Kensington Underground station. We can arrange guidance from the station and supply our phone numbers to make getting there as easy as we can. If you want to come, email meetup@aniridia.org.uk as soon as possible so we know how large a space to reserve. We will then send you the details once arranged. Tell us if you would like to be met at the station. If you can’t come, how about organising a meet-up of your own? There’s a real appetite around the country for get togethers – it just needs some people to set them up. Contact us for details of how we can help you make it happen near you. This entry was posted in ANUK news and tagged meetup. Bookmark the permalink.